Coconut oil is one of the healthiest oils on earth. It's an all natural multi-tasker and can be used in cooking as well as topically to moisturize and treat your face, body and hair. 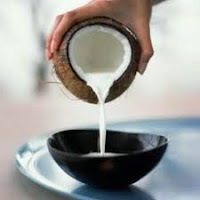 Coconut oil also contains short and medium-chain fatty acids that help in taking off excessive weight. Aim for 3 tbsp. of coconut oil a day as part of your healthy diet. Research shows your waistline will noticeably be smaller without any extra effort on your part by just consuming 2-3 tbsp. per day. You can learn more about Coconut oil in my post, The Benefits of Coconut Oil. Make sure your only consuming the highest quality coconut oil that hasn't been processed so it maintains all the nutritional qualities, . Look for 100% Organic, Unrefined, Cold Pressed, Extra-Virgin Coconut oil . Coconut oil is excellent for cooking and can be used in stir fries, when sauteing, in baking, or when making oil popped popcorn. In fact, much of the popcorn eaten at the movies in the United States is flavored with coconut oil. If substituting for vegetable oil, remember that coconut oil is solid at cool temperatures and so may not be suitable for salads that will be refrigerated. When making a fruit or yogurt smoothie, slip in a couple of teaspoons of coconut oil. It will add to the flavor and help make it lovely, smooth and creamy. Alternatively, you can use a small amount of sweetened or unsweetened coconut milk as a substitute for regular milk or yogurt. For a thicker smoothie, freeze it first, then add to the food processor to whip it up. Coconut oil is solid at cooler temperatures, like butter, and can be used as a butter substitute for many things. Use it as a spread on your morning toast or to make garlic bread. Coconut oil can replace butter, margarine or vegetable oil in baking. When using coconut oil as a substitute, it should be reduced by about a quarter, so use 3/4 cup for every cup of butter. If you prefer the taste of butter, you can use one half butter, one half coconut oil. I have not tried coconut oil yet, thanks for the information..